The Seller Adams Business Media (ABM) http://www.adamsbusinessmedia.com/ is a communications company that provides business-to-business solutions through the integration of print and electronic media forums. ABM focuses on developing, acquiring and operating business to business publications, industry websites, industry book and video sales, data mining, custom publishing and multimedia marketing projects for key, growth-oriented markets. 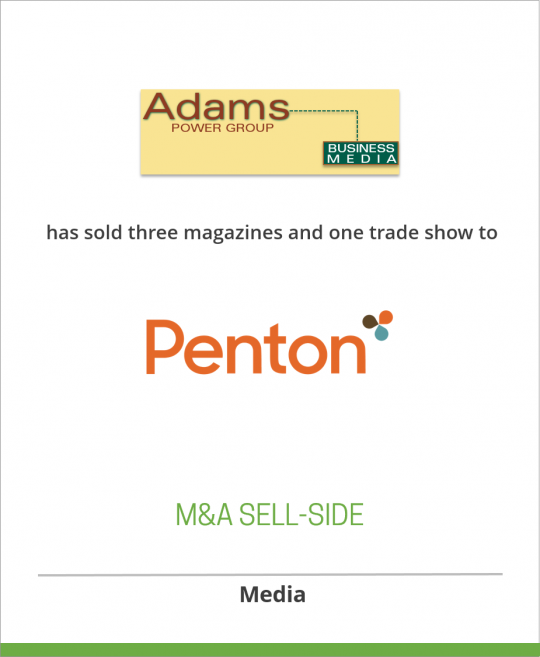 Three magazines and one trade show comprise the Power Group. The three publications of the Group – Power Value, Power Quality, and PCIM – serve audiences in the electric power industry: general management requiring an industry-wide overview, plant operations management, and electronics engineers who design power systems and equipment. In addition to the magazines the Power Group includes the PowerSystemsWorld Trade Show, PowerEngineering Book Guild, a licensing arrangement for a European publication, and a group of Web sites. The Buyer PRIMEDIA, with 1999 sales of $1.7 billion, is a targeted media company with print, video and Internet businesses focused on consumer and business-to-business audiences. Some key businesses include Seventeen, New York, Chicago, Fly Fisherman, Channel One Network and 16 other specialty satellite television and TV distribution services, Horticulture, Modern Bride, American Baby, IntelliChoice, Telephony, American Demographics and Films for the Humanities & Sciences. The Company owns and operates more than 300 Web sites and other Internet properties. For more than a century, Intertec Publishing, a division of PRIMEDIA, has provided information to people to help them do their jobs better. As a leading company in business-to-business publishing, Intertec connects industry manufacturers and suppliers with qualified professionals who rely on essential statistics, how-to-explanations, technical advice and product introductions to make their businesses successful. Intertec’s technical and trade publications serve 3.8 million subscribers in agribusiness, communications, electrical and public services, entertainment, industrial, marketing, professional services and apparel, and transportation.